I think it was French singer Johnny Hallyday who had a hit in his native country with Le Bon Temps Du Rock’n’roll, a title which perhaps inspired this budget album back in 1973. So what’s that got to do with us? Well, is it me or is that Ritchie Blackmore gracing the sleeve? I turned this up on one of my regular charity shop trawls looking for strange and interesting album sleeves. It was in the Oxfam shop on Marylebone High Street, not one of my regular haunts I have to admit (chance would be a fine thing, have you seen the price of property round there? ), but one of the more interesting areas of London in which to potter. The shop had a whole rack of mostly classical albums but this was buried amongst them and the sleeve just stood out. I took a chance and then we retired to a nearby cafe to rest our feet. Under decent lighting it looked even more certain to me; all the trademarks are there – the over the shoulder glance to Lord, the Fender Strat, the big tremelo arm, the Marshall, the necklace, the short sleeved button necked top, the hand hammering on the neck, etc. My guess is that this was taken during the strobe sequence in Mandrake Root circa 1970. I have seen other long exposure shots taken during this part of the set which look very similar (there’s one on the DTB site here), but have not spotted this one before (it is credited to an ‘unknown’ French photographer, so may have been taken at the Paris Olympia gig in 1970). Nor have I ever seen the album before, which was released on the French EMI label Pathe Marconi in 1973. “Dans la meme Serie Punch” were other budget albums of trumpet music, South American pan pipes, the inevitable Edith Piaf set, and so on. Serie Punch was a low-priced imprint designed to sell in French supermarkets and launched in 1973. 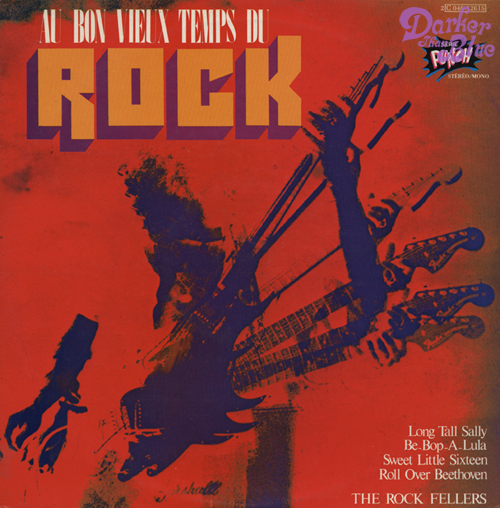 This particular album is a collection of middling 50s rock and roll cover versions performed by The Rock Fellers (probably a made up name for a bunch of slick session guys). I can only assume some designer at VDK (who did the sleeve) was a bit of a DP fan and thought to subvert the lacklustre content with a heavier sleeve. Well, 35 years on it worked for me. Interestingly the typeface for the title is one you would normally expect to see on 80s covers, so I was quite surprised to see how old the release was. Anyhow, catalogue number 2C046-12615 if you’re dashing off to try and find one for sale. Another one of those long exposured photographes can also be found on the cover of the “Space Vol 1 & 2” booklet — the 2001 Soniczoom version. Shadows on the fretboard would suggest the scalloped frets that RB uses. When did he first use this type of neck? My guess is mid-69 when he started using the black maple-board Strat. He often referred to the scalloping in his interviews, although it appears he preserved his Gibson 335 unscalloped. If you look at the pics from concerts in 1970 the fingerboard was already scalloped by then, and he had the fatter trem arm by that time too (look at the sleeve photos from the BBC In Concert double album, for example). Interesting footage for those afflicted like me is from the Bilzen Jazz Festival in August 1969: the black Strat must have been a very recent acquisition and he still had the factory fitted (?) trem arm, but the frets look already to have been scalloped to some degree. I understand he used both Gibson and Strat on In Rock: listening bears this out, as Child In Time sounds like the Gibson, whereas the raucous numbers such as Speed King and Hard Loving Man are with the Strat. Sound right Damian, I’ve never seen the Gibson frets customised. There is more on this in the In Rock book, and we’ve got a little article on the black Strat due soon here. Well “It has a lot to do with us” actually! Johnny Halliday had Bobby (Woodman) Clarke on Drums. The very first drummer for the embryonic Deep Purple (Roundabout). Also, as the track list of the LP has ‘Be Bop A Lula’, Featuring Blackmore on the cover isn’t too much of a stretch! He was right there with Gene Vincent and Jerry Lee Lewis tearing up the stage in the early 60’s. Love these early connections! What a Pedigree the Purple men have had. Thanks for those bits of details Scott. I’m not sure which particular band Blackmore spotted Clarke in, it is likely to have been Vince Taylor I think. Bobby also apparently has the honour of being the first musician to be deported from America for possession of pot! Great find, Simon. Dropping the pic into photoshop and hitting ‘invert’ gives you the positive; Although his face is blurred, the whole stance is unmistakebly RB….